Geometric pattern design is arguably the most recognizable form of Islamic art — it shows up everywhere, from mosques to government buildings to paper. While geometric art dates back to the ancient Greeks, most agree that this traditional form of Islamic geometric art originated in North Africa in the 9th century, showing up in simple patterns and designs in the Great Mosque of Kairoun in Tunisia. The patterns often appear to be complex yet can be produced with a simple ruler, pencil and a compass. These patterns have since appeared in many formats, including ceramic, wood, stone, rugs, leather, stained glass and of course paper. 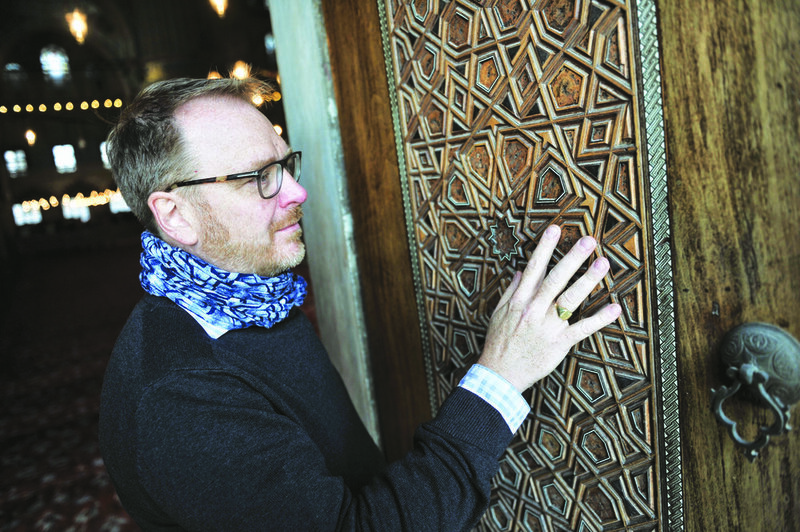 Eric Broug, originally from the Netherlands and currently living in the United Kingdom, is one of the world’s leading experts in Islamic geometric pattern design. He received his Masters degree in the history of Islamic art and architecture from the School of Oriental and African Studies, London. He is the founder of Broug Ateliers for Islamic Architecture, Arts and Crafts in Yorkshire, which creates contemporary Islamic art. He trains others in the art and holds regular workshops globally. He has published three books on the subject — the latest one titled Islamic Design Workbook. You can also watch a TEDed video on Islamic geometric design that I’d highly recommend. I recently had the opportunity to catch up with Eric Boug and asked him about the art and his inspiration. 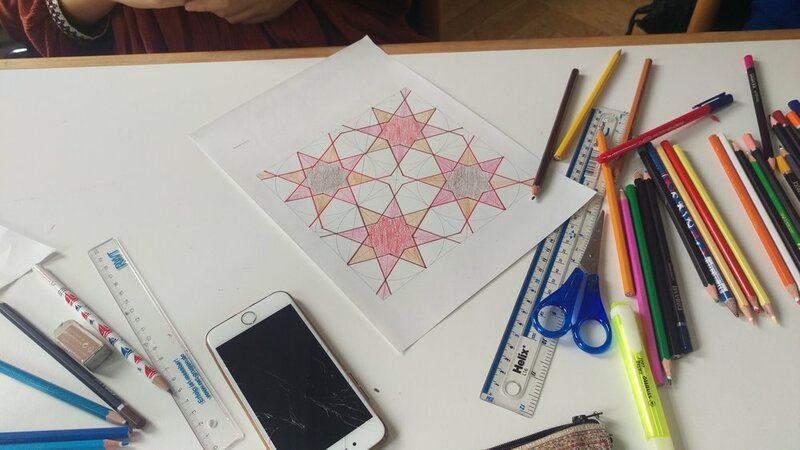 1) What inspired you to get into Islamic geometric design? I first became interested in Islamic geometric design when I was a student of Middle Eastern politics at the University of Amsterdam. I realized that although politics was interesting, it was not that interesting and I wanted to find something that would keep my head and heart engaged for the duration of my life. 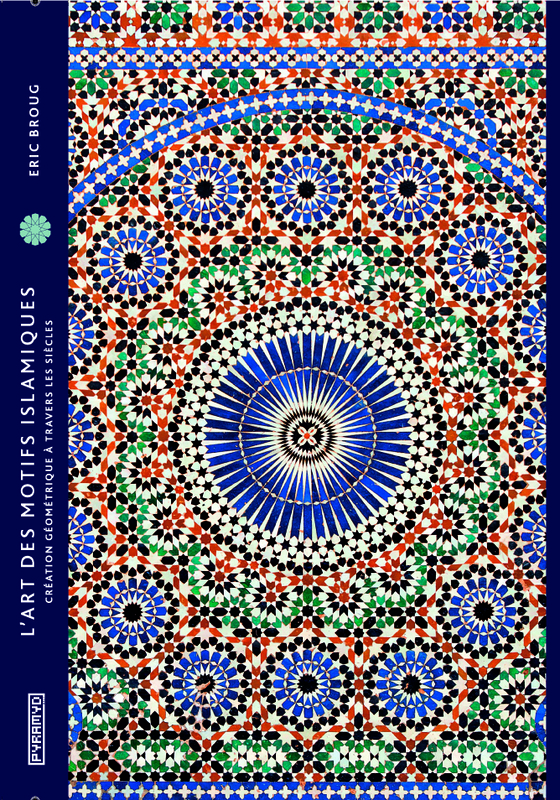 So, I dropped out of university and soon thereafter found a book on Islamic geometric design (Arabic Geometrical Pattern & Design by Jules Bourgoin). I realized that it offered a whole new horizon for me: it was art, it was history, heritage and creativity. But I also realized that if i was going to pursue this as an alternative to a more conventional career choice, I would have to do so with total commitment. Not as a hobby, but as a vocation. 2) What's unique about this art in comparison to other Islamic arts like calligraphy and tezhib? I think the way it has universal appeal and is probably the most recognizable aspect of Islamic visual culture. Geometry is a universal language, and Islamic geometric design resonates or speaks to people, regardless of age, background, etc. I see this all the time in my workshops. People of course appreciate the beauty of Islamic geometric design, but it is also the ability they can develop to ‘read’ it, to understand it, that is enlightening. My answer is biased of course because my passion is for Islamic geometric design, even though I am interested in all aspects of Islamic art. 3) Why should someone learn this art and how difficult is it for beginners to learn? It is not difficult, not the way I teach it, in any case. If you can draw circles and lines, you can do it. The craftsmen who made these patterns over the centuries were not mathematicians, they were people who made things with their hands and their main tools enabled them to draw lines and circles. My premise is, that if they were able to make all these complex patterns with just circles and lines, we should also be able to learn to do so. Why should someone learn it? It is good to make things with your hands. Nowadays, computers dominate so much of our output, it is good to sit at a table with a pair of compasses and a ruler and to create something . By drawing these patterns, you also connect with a design heritage, not just by looking at it but by making something. 4) What is the process of coming up with your designs? For years, I spent hours every day trying to deconstruct these patterns in order to reconstruct. This informed how I teach these patterns in my books and workshops. I still get a lot of enjoyment out of trying to present these centuries-old patterns in new ways; trying to present them as belonging to the 21st century, not just as something from the past. It’s important to realize that these patterns are not black lines on a white background. They are an art from and the different ways they are embellished are an integral part of this design heritage. So, my personal creative challenges are: how can i teach this pattern in the most simple way, with the smallest number of steps; and how can i present a pattern in a new way. 5) Your advice for students interested in getting started in this art. You have to find enjoyment in the process. It is not only about the result. The process of drawing these patterns and getting better at it is where you learn. Especially in the beginning, do your drawing by hand, not by computer. There is great value in learning how to draw these patterns in the same way as it has been done for centuries. Computers are always 100 percent accurate, but drawing patterns by hand is never 100 percent accurate, yet this is where you learn the most. And with anything: commit to it, dedicate yourself to it and make time. A lot of people who buy my books or come to my workshops have families, young children, jobs etc. My advice is to create a small space in your house where you can sit and where all the things you need are ready and waiting for you, so that when you have an hour, you can just start, without having to tidy up first, etc.